Perfect for spur of the moment, spontaneous STEM time! It's STEM Quick Challenges! Can you use a few supplies and build a structure? These challenges are quick, easy prep, easy materials, great fun, and can be used on the spur of the moment! This is a money-saving bundle of fifteen Quick Challenges! 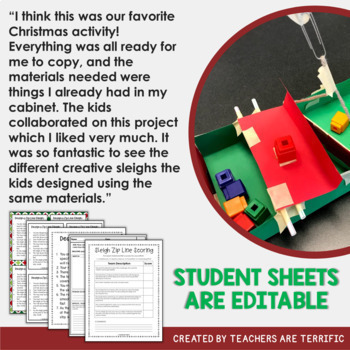 Here’s a perfect STEM challenge to try during the busy Christmas holiday season. 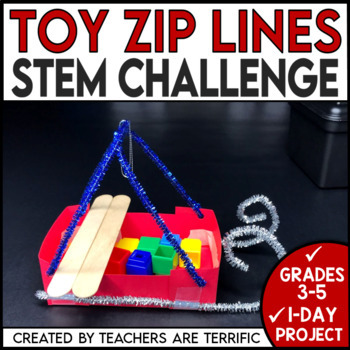 This will be exciting for your students and you will love the easy prep of this STEM Quick Challenge. 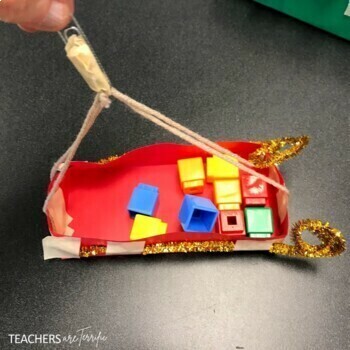 Students will be designing a sleigh that will carry toys down a zip line- without dumping any of them out! This is a Quick Challenge. Detailed instructions are not included, although you will find that in STEM Challenges and STEM Activities from Teachers are Terrific! Rather, this exploration is just that- an exploration time with limited supplies and spectacular results! Your students will love the freedom of a quick challenge as they get right to work and learn as they go! Simple teacher procedures and tips are included. Just talk about the Criteria of the task, and let them get busy planning, designing, collaborating, and learning! Materials needed for the STEM Challenge include craft sticks, cardstock, construction paper, string or yarn, straws, pipe cleaners, paper clips, masking Tape, zip line, and TOYS! Our zip line is a piece of fishing line. You can also use plastic cord. For our toys we used interlocking cubes. Save money and grab the bundle of Quick Challenges! Be the first to know about my new discounts, freebies and product launchesAll you have to do is follow my store. Look for the green starnext to my store logo and click it to become a follower. It’s that easy to receive email updates about Teachers are Terrific!